Treat dry skin to the luxurious blend of baobab oil, mango seed butter and cupuacu butter found in the BAKEL Nutrifill Extra Nourishing Cream. Working to nourish and tone the skin, the cream features a number of activating ingredients including Superoxide Dismutase which fights against damage caused by free radicals therefore reducing the tell-tale signs of ageing. 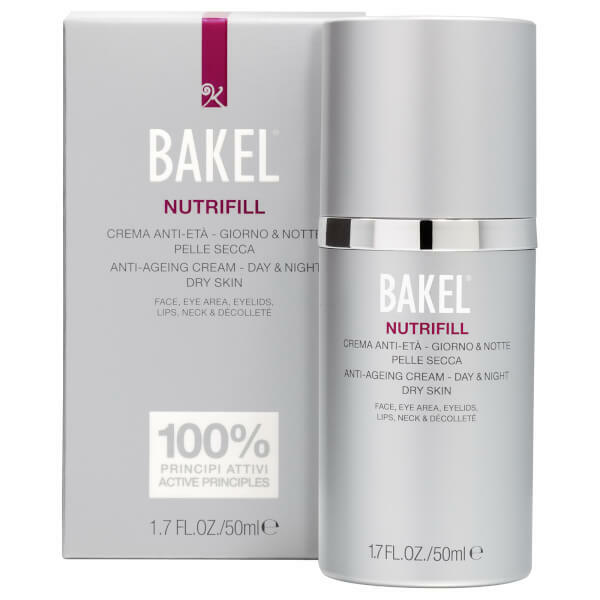 The BAKEL Nutrifill Extra Nourishing Cream is effective and works quickly to give your skin immediate comfort. A.B. BAKEL utilise 100% natural active ingredients in all of their products, ensuring whatever touches your skin is good, natural and pure. With no perfumes, alcohol, artificial colours, preservatives or animal derivatives, every BAKEL treatment is dermatologically tested and boasts minimal allergy risks. Built upon a strong foundation of objective confirmed and scientifically proven formulas, BAKEL products are suitable for all skin types and fight against the main causes of skin-ageing. Massage into the face and eye area. Advice: If you have extremely dry skin, mix with some drops of VITEA in the palm of your hands and rub into your face until absorbed. This will help to restore the elasticity, softness and nutrients to your skin.